Are Shorter Poles Better – or is it just a trend? Gone are the days of holding the pole upside down by the basket and looking for a right angle in the elbow. What if I was to tell you that the length of pole you should use directly relates to your ability as a skier and the task you are performing? More specifically how much edge you are getting through the turn? 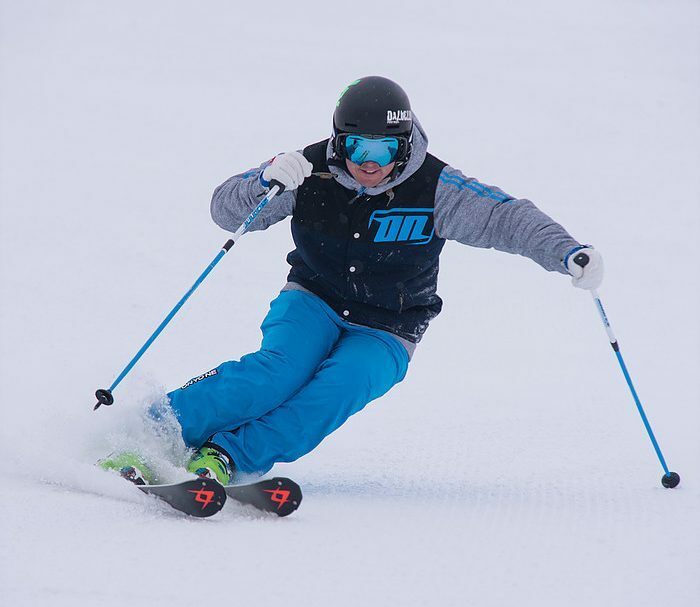 The purpose of the pole in skiing is to assist us through the transition between turns. Planting your downhill pole between turns provides a third reference and balance point when changing edges, it assists with the commitment of your body to cross the skis to change edge (and ultimately end up down the hill of the skis at the start/top of the new turn), and also helps with the timing of the edge change. On certain terrain such as steeps and bumps, or performing short turns, it can also be used in a blocking or stabilising way to provide discipline and strength to the upper body. One of the biggest contributors to a poor pole plant is using a pole that is the incorrect length. Too long and the pole can catch on the snow when swinging it forward. It can also disrupt balance when planted causing rotation of the body and/or affect the fore/aft balance of the skier. Too short and it won’t provide the necessary stabilisation at edge change. To determine the right pole length, one must look at the maximum amount of inclination during the turn. Now days, skiers are increasing the amount of inclination and edge angle to get as much rebound out of the turn as possible. This also affects the transition. High level skiers are trying to cross the skis without any unnecessary rising of the Centre of Mass (CoM). With the extreme edge angles we are striving for, the CoM has further to travel from a heavily inclined position on one side of the skis to a heavily inclined position on the other side of the skis. Unnecessary rising sees the CoM take a less direct route from one side of the skis to the other, thus slowing down the edge change and delaying entry into the new turn. Rising to a high position can also reduce stability at high speeds. As such your inclination/edge angle at it’s greatest will determine the height of the CoM during the transition. As you know, the pole plant occurs during the transition so a better understanding of your height through the transition will better define a suitable length of pole. Check out the transition comparisons in the diagram below. On the left you will see an intermediate parallel stick figure whose edge angle is not very high. The transition height from the snow is higher and a longer pole is required. As you move to the right of the diagram you will see an advanced skier laying it over with extreme inclination and edge angle. This skier will utilise a more direct transition from one side to the other and will therefore require a shorter pole. The above is the case for all type of skiing whether on or off piste. 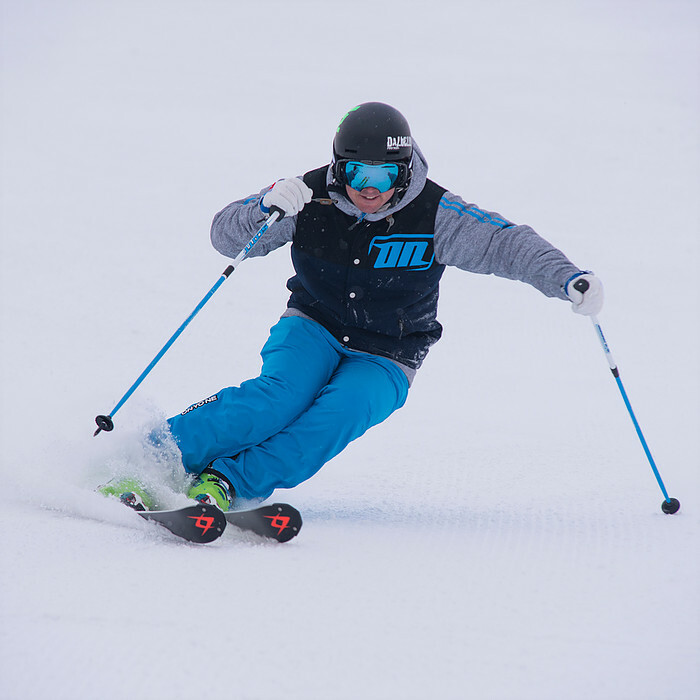 Take mogul skiing for example, the transition/edge change usually occurs when the skier is in their most absorbed/smallest position. For this reason mogul skiers use such a short pole. Of course there are benefits to a longer pole. A racer needs all the help he/she can get pushing out of the start gate and as such will require a longer pole for leverage and a longer push. A beginner will spend time on the flat and will rely on their poles heavily for balance in an upright position thus requiring a longer pole. The upside down pole/right angle in the elbow trick is great for beginners as they will be standing on their skis in this position which is why most rental shops use this method to determine pole lengths. For advanced skiers it should be rare to transition at this height and you will need to start to look at your pole length in relation to your ability and type of skiing. My suggestion to all skiers is that as you start to get higher edge angles, you should look at investing in a pair of telescopic or adjustable poles. 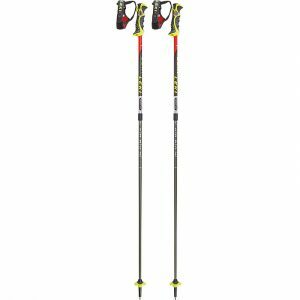 I use the Leki Venom Vario S pole which is part carbon, adjustable, incredibly light weight, and features the Leki trigger system. Over the years I have adjusted the length of this pole to find my ideal carving, bumps and low end demo length. 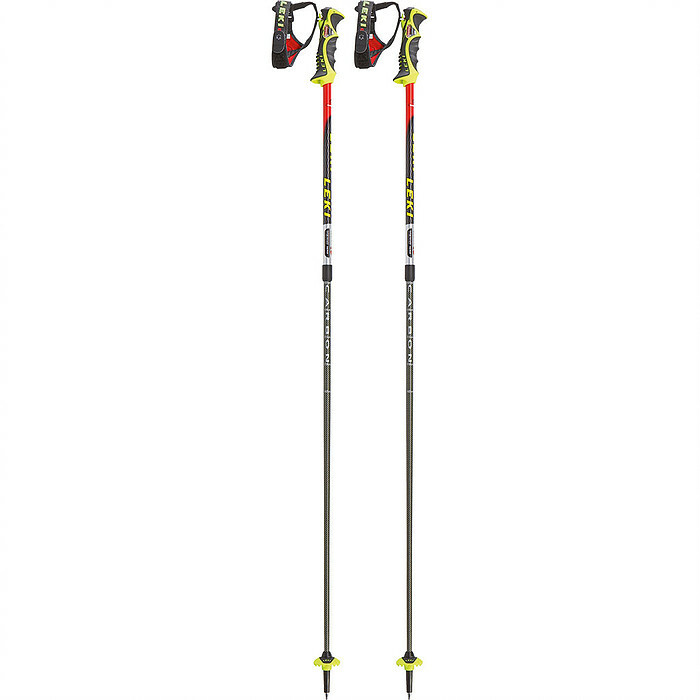 Using video and the internal cues received when skiing I was able to find an appropriate length that maximises the use of a pole plant without the above mentioned negatives. Ideally my arm/hand should not bounce upward very much/at all when I pole plant. You can watch in your peripheral or on video to see if this is happening and whether it is affecting the discipline of your upper body. I am 180cm tall and I am currently skiing with my pole set to 110cm for high end skiing on and off piste, 105cm for moguls and 118 for low end demos when teaching. We use our poles heavily for balance not just when pole planting but also when our inside pole is dragging along the snow inside the arc. Without realising it the pole dragging provides our brain with much needed proprioceptive data to determine where we are in relation to the snow. I found that after skiing for years with a 120cm pole, it took me a little while to adjust and feel natural when playing around with different pole lengths. Now that I have found the right height for me, it allows me to pole plant with the most efficiency while maintaining a relaxed and natural upper body position when I ski. Check out the clinics section of the Poul Lorenz website for info on upcoming clinics so that we can work together to find the pole length that’s right for your skiing (and improve your skiing along the way). Next story What it’s Like to Stay in a Luxury Ski Chalet? Paul Lorenz is a current APSI Level 4 Ski Instructor Trainer/Examiner, Interski Team member and Technical Committee member. He has competed in technical skiing events such as the US Powder 8 championships, the Swiss Snow Happenings and the Japanese Technical Skiing Championships. Paul is also a Projected athlete featuring in many of the Projected Productions “How to Ski” videos. Paul is the owner of Paul Lorenz Clinics which offers courses specifically focused on progressing your ski technique and mechanical understanding.